Growing up in a small fishing town in the Acadia region of Maine, Morgan Gilman developed an early appreciation for the natural beauty of her surroundings and the generosity of others. “My family didn’t have a lot of money and there were times we received help from social programs, where my mother often volunteered, to get by,” recalls Gilman, a PhD-candidate in the Molecular and Cellular Biology (MCB) program at Dartmouth’s Geisel School of Medicine. But when Gilman, an excellent student, was offered a scholarship from the Veteran’s Association (as a child of a disabled veteran) to attend the University of Maine at Orono, she jumped at the chance. After initially focusing on mathematics, she became “rapidly addicted” to science, earning a bachelor’s degree in microbiology a master’s in biochemistry at Orono. 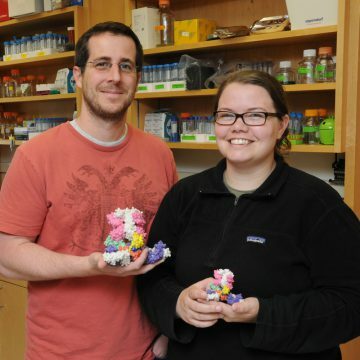 “I knew I wanted to earn a PhD eventually, but I wasn’t sure of the best path,” Gilman says. Landing a job working as a technician in the laboratory of Margie Ackerman, PhD, at the Thayer School of Engineering provided valuable experience and introduced her to what would become her area of focus as a researcher—the molecular mechanisms of viruses (in this case HIV). For Gilman, now a fourth-year graduate student, that home has been the laboratory of Jason McLellan, PhD, where she is helping lead efforts to understand how a particular type of protein (known as class I fusion glycoproteins) allows deadly viruses—such as Ebola and RSV (respiratory syncytial virus)—to gain entry into host cells, and how antibodies can be developed to neutralize that process. In 2016, Gilman published two co-first-author manuscripts in prestigious journals and then presented their findings at international conferences in Paris, France and Bariloche, Argentina. The first paper, published in the journal Science, described how the Dartmouth team collaborated with scientists from the National Institute of Allergy and Infectious Disease and other colleagues to characterize an antibody that shows great promise as a potential therapeutic for Ebola. There is still no cure or specific treatment for the virus, which killed more than 11,000 people during a 2014-15 outbreak in West Africa. The second paper, published in Science Immunology, described how the Dartmouth team, working with the local company Adimab, characterized 360 monoclonal antibodies against the RSV F protein that were isolated from memory B cells of adults. The work has brought novel insights into efforts to develop a vaccine and passive prophylaxis for RSV—an extremely common and highly contagious respiratory pathogen that is globally responsible for about 7 percent of deaths among infants between one month and one year of age.